This script will first break inheritance of the site and then create three groups (owner, member and visitor) and add these to the site with the specified permissions. 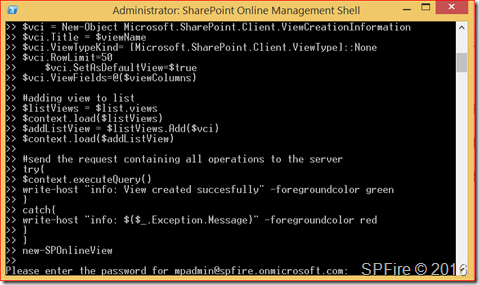 We will first start by opening the SharePoint Online Management Shell as administrator which can be downloaded at https://www.microsoft.com/en-us/download/details.aspx?id=35588. $siteGroups = "$($web.title) visitors", "$($web.title) members", "$($web.title) owners"
Is there an easy way that this can be modified to set permissions for document library’s? break all the inheritance for a doc library and then grant new permissions to a user and some groups? You can then add users/groups using CSOM.